The climate in Halong is wet tropical and affected by monsoon’s operation. It’s divided into four seasons: warm spring, hot and moist summer, cool autumn and dry and cold winter. The summer is from May to August, features high temperature and large rainfall. The humid southeastern monsoon blows and carries rain. The temperature ranges between 27°C to 29°C. The weather is hottest in Juneand July. From November to February is the winterfeaturing low temperature and little rainfall. The weather is dominated by the dry and cold notheast monsoon. The average temperature is from 16°C to 18°C. Between the two main seasons are transitional months with the featuresof spring and autumn. The annual rainfall is between 2000mm and 2200mm. 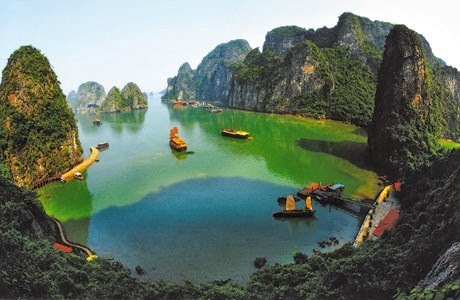 On Halong bay, the tide is the typical diurnal tide. At the time of tide, the sea level usually rises up by 3.5 to 4 meters. The salinity is about 31-34.5 MT. This figure depends on the seasons: the salinity in the dry season is lower than that in the rainy season. From May to October is the active time of sea storms on the Gulf of Tonkin. However, because Halong Bay is situated deep inside the Gulf of Tonkin and features various islands, it’s less affected by the sea storms.